In my last post I shared 5 strategies to use when beginning to differentiate instruction in your classroom. For now the focus is on readiness. 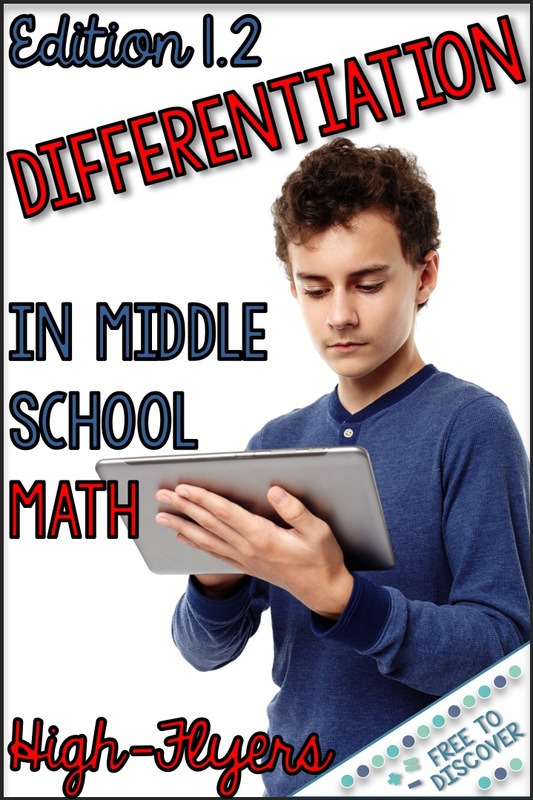 Today I will provide 2 concrete ideas for how you can differentiate for your high flyers in your math classroom. Once you give a pre-assessment to students, you will need to consider the data you are presented with. It’s possible that you could have students who can already do 100% (or almost 100%) of the tasks you will learn in the next unit. What do you do then? Curriculum compacting is when students can test out of a unit by demonstrating their fluency in the topic before the instruction even begins. Many times there will be ways to challenge the students with the regular curriculum (more on this), but sometimes the topic can be really basic and worth moving on entirely. There have only been two units that I have allowed curriculum compacting. With the transitioning of new curriculums and students switching from accelerated to standard math, one year I had a group of students who had already learned the Pythagorean Theorem. During the two days when I introduced the topic and we “discovered” it in class, I set the small group of students up in a nearby location with notes and practice with simplifying radicals. 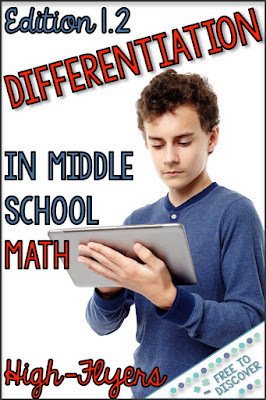 This is not a topic that we typically cover in 8th grade, but we had just finished estimating radicals and I wanted to give them a stretch assignment. They met with me each day at the beginning and end of class so I could provide some explanation. This was very successful, however, I do not recommend giving this topic on an assessment unless you have spent some significant time checking for understanding. It’s a great growing experience for these students. In a more extreme case, I allow my students in accelerated math the opportunity to test out of the unit on exponent rules and polynomials. Each year 1-4 students come to me having already mastered this topic. It’s a tough one to extend so I designed an independent study. Read on! When students have tested out of a unit, they will need a unit of their own. This takes a ton of time and effort so I’ve only ever created one. Our units on exponent rules falls right after systems of equations, so it seemed appropriate to design an independent study on matrices so that students can be introduced to matrices, matrix operations, and solving a system using an augmented matrix. Yes, they will learn all of this in Algebra II, but I feel as though they are getting a nice basic foundation with me and then when they do take Algebra II in two years they can build on their prior knowledge. 1) Map out a curriculum based on an Algebra II textbook I had laying around at home. 2) Create a learning contract to send home to be signed by parents and students. This outlines rules, objectives, assignments, and deadlines. 4) Give students one lesson per day to read through and a corresponding practice problem set to complete. Students can work together and can use technology (when it’s available). 5) Each day students turn in the assignment from the previous day and take their new assignment. 6) I provide verbal or written feedback at least every other day to ensure they’re staying on top of their tasks. 7) The assessment is open notes and they also complete a multi-part project. The total points value equals the number of points they would have accumulated in class. This independent study takes the place of those points. This has been a huge success among my top students. Parents really appreciate the extra challenge for their kids, too. 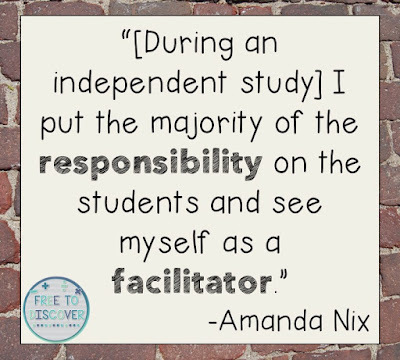 I put the majority of the responsibility on the students and see myself as a facilitator. It is a lot of work, but once I set it up one time it was easy to use over and over again. If you have any questions about these strategies, please feel free to leave a comment below or send me an email. 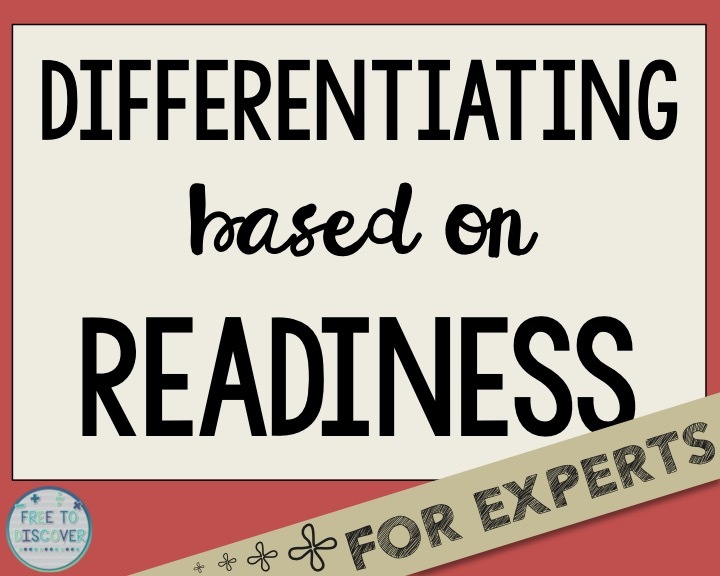 Next time I will share 3 more strategies for differentiating by readiness that can benefit all levels of students.